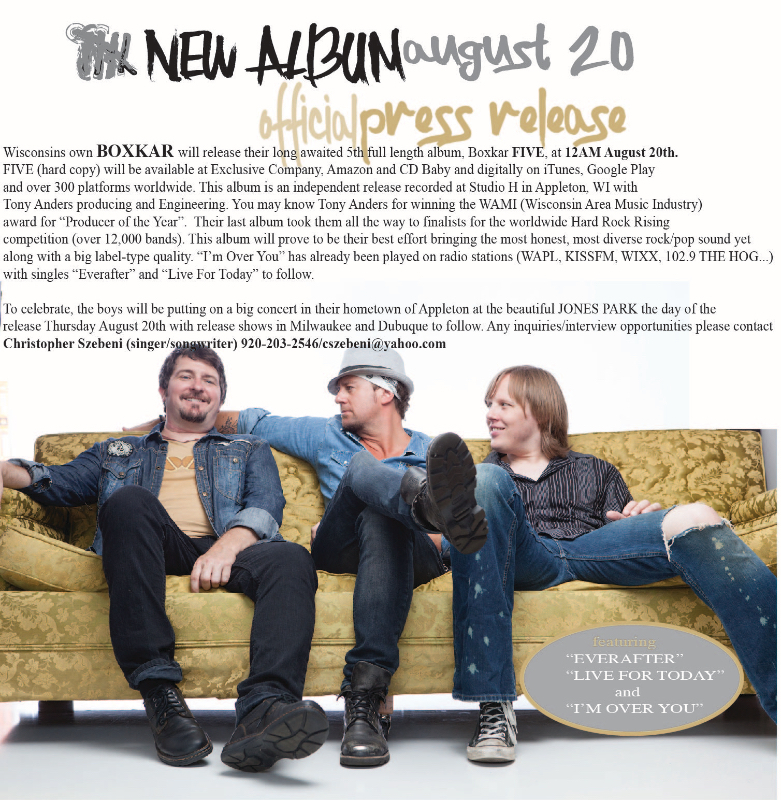 Posted on Aug 15, 2015 by Appleton Downtown Inc.
Wisconsin's own BOXKAR will release their long awaited 5th full length album Boxcar FIVE at 12 am August 20th. FIVE (hard copy) will be available at Exclusive Company, Amazon and CD Baby and digitally on iTunes, Google Play and over 300 platforms worldwide. This album is an independent release recorded at Studio H in Appleton, WI with Tony Anders producing and Engineering. You may know Tony Anders for winning the WAMI (Wisconsin Area Music Industry) award for “Producer of the Year”. Their last album took them all the way to finalists for the worldwide Hard Rock Rising competition (over 12,000 bands). This album will prove to be their best effort bringing the most honest, most diverse rock/pop sound yet along with a big label-type quality. “I’m Over You” has already been played on radio stations (WAPL, KISSFM, WIXX, 102.9 THE HOG...) with singles “Everafter” and “Live For Today” to follow.